We love any reason to celebrate at our house and today is Fat Tuesday which means delicious food, generous drinks and good music. 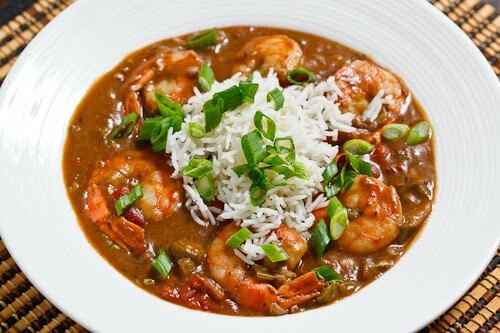 I've only made gumbo once before, and it didn't turn out all the great, disappointing for the amount of time and work that goes into the dish. So this year, I did my research, a lot of research, to piece together an attainable and tasty gumbo. You'll find many recipes that take about three days to prepare, this isn't that recipe, so some may say this isn't authentic, but I'm not afraid of taking a few short cuts in my cooking game! So pick up a King Cake at your local bakery, play some Trombone Shorty, mix yourself up a hurricane and put a batch of this gumbo on the stove top. Enjoy friends and Happy Fat Tuesday! 1 carton chicken stock, 32oz. 1 carton seafood stock, 32 oz. Preheat oven to 350. Place flour and one cup of vegetable oil in large heavy bottomed pot, preferably cast iron or enameled cast iron. Mix well and place into middle of preheated oven for 1 1/2 hours. Stir about 3-4 times throughout the cooking time. Once the mixture has turned a deep brown, similar to dark chocolate, the roux is done. Remove from oven, place into heatproof bowl and set aside. Clean out the large pot and place two tablespoons of vegetable oil in the pot over medium to high heat. Place the holy trinity in the pot and cook for about 5-7 minutes or until soft. Add garlic and cook another two minutes. Add in both stocks and mix the roux in as well. Add all seasonings, chicken and sliced sausage to the pot and stir. Heat over low-medium heat for about 1.5 hours, stirring occasionally. After 1.5 hours, add the okra and cook for 30 minutes. Then add the shrimp and cook for about 10 minutes or until shrimp is fully cooked. Serve over rice, sliced scallions on top and with a Cajun seasoning and hot sauce of the side.